Tae Kwon Do simply translated means a way of (Do – Arts) Foot (Tae) and Fist (Kwon), but that only implies the physical part of Tae Kwon Do. The true meaning of Tae Kwon Do is “a way of mind and body,” as often times people will refer to martial arts as a way of life. Tae Kwon Do originated in Korea around 2000 years ago, most likely beginning to formalize during 3 kingdom’s dynasties (BC 18 through Ad 668). Just like other formalized martial arts from Japan and China, it began with the purpose of self defense against wild animals and enemies to protect oneself and nation. Many of the movements imitated wild species actions, such as tigers, cranes, etc. Today’s Tae Kwon Do has been modernized by many of martial arts’ masters during the late 1940’s to early 1970’s; especially General Hong Hee Choi, who later became founder and chair person of I.T.F; and Dr. Un Yong Kim, W.T.F Founder and creator of Olympic styled Tae Kwon Do. The goal of Tae Kwon Do is not only to learn self defense techniques, but also to learn self discipline and to experience philosophical ideas. By doing so, one learns how to adapt well in society with different individuals and groups, which can help one become a leader. Regardless of differences in one’s character, living conditions, or social positions, students will benefit from having great peace away from multiple stressors. The benefits of Tae Kwon Do are numerous and can be enjoyed by children to seniors. An obvious advantage is that it is a physically exerting activity. It is always good to see children exercising, but they don’t always enjoy it. Tae Kwon Do is so much fun; it takes very basic movements that all children are capable of: punching, kicking, jumping, and translatory motion (linear, curvilinear), and turns them into a skill. Even the most challenged children (ADD, ADHD students, poor physical conditioned students, and poor behavioral students) are able to accomplish some form of Tae Kwon Do, increasing their balance, physical strength and mental capacity, and this builds self-esteem for them. 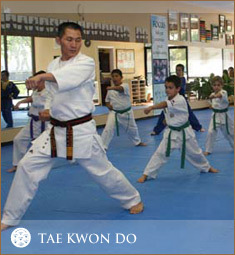 Tae Kwon Do is not a team sport; it is self motivating and encourages children to pass their own perceived skill level. The discipline and respect that are a very important part of Tae Kwon Do help children learn how to behave at home, school and in preparation for their futures. Tae Kwon Do is not only fun but a great form of exercise as well. It is aerobic, and can be a tremendous workout, with a lower chance of strain or injury. Tae Kwon Do has helped many adults stay in good shape while learning the valuable skill of self defense. Learning Tae Kwon Do forms can help improve dexterity and enhance memory skills, and is a great escape from everyday stress. There is also a cultural experience in Tae Kwon Do. It is enriched by 2000 years of history from Korea, its philosophies and living wisdoms, which can only be gained by learning the traditional form of Tae Kwon Do from a well trained and socially well rounded authentic instructor. When I was young my father taught me winning skills for life’s journey. There are many philosophical and logical lectures and wisdoms that I heard and learned from him. I would like to share one important saying that greatly influenced my life and I still practice which affects my life: “A life is all about art of practice”. Whatever you do in life it is all about practicing it. Whatever you chose for yourself if you do your best at it will bring a successful result. A positive practice will bring the great success and a negative practice will bring the failed dream or painful lesson of duty of life.